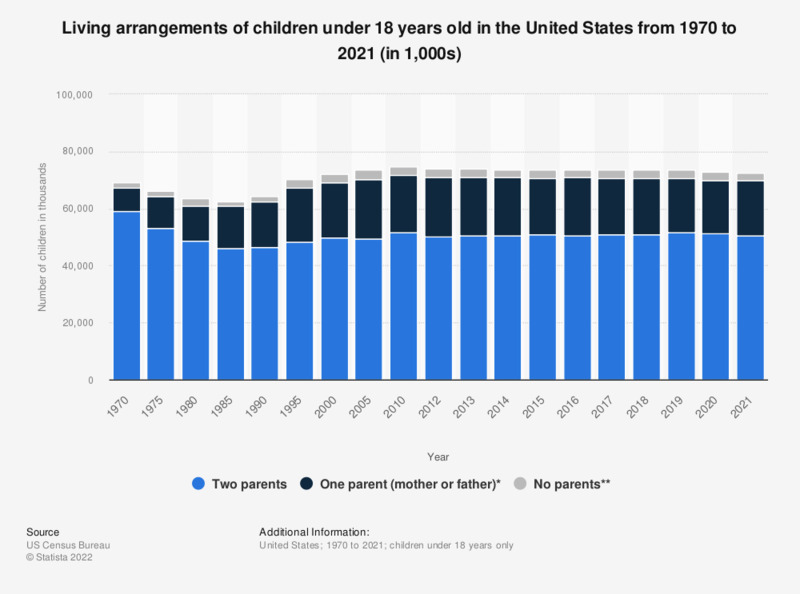 This statistic shows the number of children in the United States who live with their parents, one parent or no parent on a timeline from 1970 to 2018. Detailed figures for children living with either a mother or a father only can be found here. The figures for children living with other relatives or non-relatives have been added up for the "No parents" column. Detailed figures can be found at the source. In 2018, about 19.65 million children in the United States lived with one parent. *Detailed figures for children living with either a mother or a father only can be found here. **Children living with other relatives or non-relatives only (detailed figures for both at the source). Foster care and adoption in the U.S.
Everything On "Foster care and adoption in the U.S." in One Document: Edited and Divided into Handy Chapters. Including Detailed References. What do you think are the main reasons why couples do not have more children? Parents: Do you want to have more children someday, or not? Which of the following early childhood education possibilities do you consider useful?